It was a proud night for ICC and the Culinary Arts Institute during the Heart of Illinois Hospitality Association’s (HOIHA) Winterfest 2019 celebration, which was held at the Peoria Marriott Pere Marquette on Mon., Feb. 4. 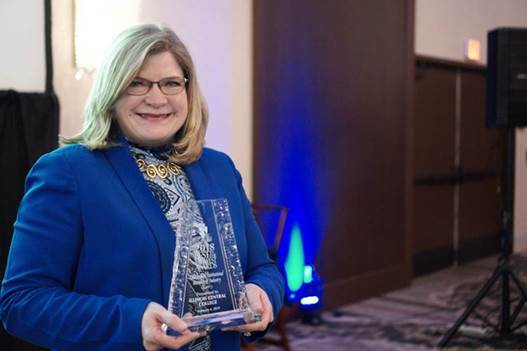 ICC President Dr. Sheila Quirk-Bailey accepts the HOIHA “Best in the Midwest” award on behalf of the College at the organization’s annual celebration Feb. 4. During its annual celebration, HOIHA awarded ICC the prestigious “Best in the Midwest – Education/Institution/Business/Industry” designation. It was the first year for the College, as an institution, to receive this award. The ICC Culinary Arts Institute was the recipient of the award in 2018. ICC Culinary Arts program student Elijah Pulley was awarded the HOIHA “Student Chef of the Year” award on Feb. 4. ICC Culinary Arts program student Elijah Pulley also was awarded “Student Chef of the Year.” Pulley also was nationally recognized as the American Culinary Federation’s “Young Chef of the Month” for Culinary Insider’s June 2018 edition. 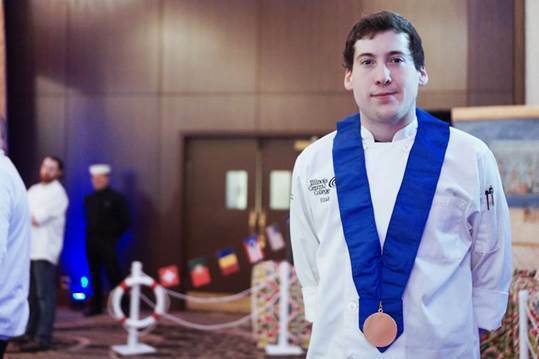 He is a second year student at ICC and was invited to work with Union League Club’s Executive Chef Michael Garbin in Chicago. All six nominees for the Heart of Illinois (HOI) Chefs Chapter Student Chef of the Year were ICC Culinary Arts students or recent graduates of the program. In addition, Chef Charles Robertson and Chef Keith Shank were nominated for HOI Chefs Chapter “Chef of the Year,” as were ICC alumni Chef Golda Ewalt and Chef Amy Carey. The ICC Culinary Arts Institute presented the appetizers for the event, in which each station was a designation port of call on the Mediterranean. ICC’s port of call was Spain, and students served Spanish Tapas to guests.